The ideal rapid transit line looks something like a straight line. It can have deviations, but on a map it will be more or less a line with a definitive direction. Most rapid transit lines are indeed linear, or failing that circular (to provide circumferential service) or L-shaped. In most cities there are just a handful of C-shaped exceptions: London has just one (the Piccadilly Line), Tokyo two (the Marunouchi Line and the Yokosuka-Sobu Line), Paris one (the RER C; Metro 2 and 6 should really count as a circle), Seoul one (Line 6). In contrast, in some cities, such as New York, there are many C-shaped lines. Since most people aren’t traveling in semicircles, it’s worth talking about reasons why cities may build lines that don’t have the most efficient shape. Cities right next to a large body of water may have lines that double back. Chicago has the Blue Line, Toronto has the Yonge-University-Spadina Line, San Francisco has the Daly City-Dublin and Daly City-Fremont BART routes and the T-Third Muni route. If Boston extends the Green Line to Somerville, the Green Line will form a C. Tokyo’s Yokosuka-Sobu through-line is in this category as well. Usually, the transit operator doesn’t expect anyone to take the line for its full length; Toronto is planning a crosstown line bridging the far ends of the C. Such lines are C-shaped because they are really two interlined lines coming from the same direction. This can be similar to reason 1 in that nobody is expected to take the line along its full length, but here the joining occurs at the outer end. Singapore’s North-South Line and Vancouver’s Millennium Lines are both examples of this. In Singapore’s case this comes from an international boundary; in Vancouver’s it comes from the need to connect the line to the Expo Line so that trains can go to the maintenance yard, and it proved too hard to connect the lines at the inner end, at Broadway/Commercial. In both examples, what should really be two separate lines are joined by an outer loop that functions as somewhat of a circumferential, but the lines were not planned to provide circumferential service and are not good at connecting to anything other than the two joined lines. (Singapore built a separate circumferential, the Circle Line.) Arguably, the RER C falls into this category too, except the connection between the lines is too inner. Hong Kong’s Kwun Tung Line is circumferential in the sense that it doesn’t serve Hong Kong Island, just Kowloon; partially because of water, it is C-shaped. New York’s G route used to be in this category back when it ran to Forest Hills, but in 2001 it was truncated to Court Square and became linear. Other lines in this category are hypothetical: if Paris’s Metro 2 and 6 count as C-shaped, then they fall into this category; Boston’s busiest bus, Line 66, is vaguely C-shaped, acting as a circumferential in the southwestern arc from Harvard to Dudley; and if New York builds Triboro RX then it will fall into this category, too. In this case, usually another reason, or a pure ridership concern, is what prevents completing the line as a full circle, but the line is configured to be useful for interchanges. The Kwun Tung Line is useful for end-to-end trips, but the other hypothetical cases aren’t: Triboro RX would be useful for short trips, but to get from the Bronx to southern Brooklyn, the D is much faster. In regions without much intergovernmental cooperation, administrative boundaries can be as sharp as coastlines. Everything proceeds as in reason #1, but this time the inefficiency is entirely preventable. This specifically affects New York and SEPTA Regional Rail. Morally, New York’s north-south lines should connect the Bronx with Brooklyn and the east-west lines should connect Queens with New Jersey. But because New Jersey is administratively separate, the Queens lines loop back into Brooklyn, creating some awkward shapes on the F, the R, and especially the M both before and after its recent combination with the V. (Some Bronx-Brooklyn lines are also awkwardly shaped, but this is because of water). Likewise, SEPTA Regional Rail barely goes into New Jersey, and only in Trenton; PATCO, serving Camden, is separate, and as a result, while the system had the R# designations, the R5 and R6 were C-shaped and the R7 and R8 self-intersected, helping ensure there was not much suburb-to-suburb ridership. In some cases, such as the Marunouchi Line or Singapore’s self-intersecting Downtown Line, there’s no apparent reason, and in that case the two branches combine to form a C-shaped line for essentially random reasons. Maybe the ideal route through city center is one that connects two branches in the same direction; maybe there is more demand to one direction than to the other. Of the above five reasons, it is reason 4 that is the most angering. Jersey City and the hill cities to its north have as long a history of ferry-oriented New York suburbanization as Brooklyn. But because of administrative reasons, they never got as much rapid transit, stunting their development. New York’s subway plans never really made any use of the Hudson Tubes, and even the unrealized plans for a North Jersey subway network made surprisingly little use of existing infrastructure. The result: 12 km out of Manhattan, at the same distance as Flushing, New Jersey only has Bogota, Rutherford, and Hackensack; 20 km out, at the same distance as still fairly dense Cambria Heights, New Jersey has Paramus and Montclair. It’s of course too late for New York to do things right, but for a city just beginning to build a subway network, it’s important to make sure that lines are straight and hit developing suburbs in all directions, so that they can develop as high-density transit-oriented communities, and not as low-density auto-oriented ones. Another one probably in the 5th (or maybe a combination of the 4th and 5th) is the WMATA red line. Mostly random, but maybe also because Montgomery County wanted to have a line that served only them and DC? I would’ve guessed more demand to the north than to the south, pre-Arlington TOD, but I’m not sure. 2012/12/20 - 10:09 Alex B.
I think it’s some of #2 and some of #1 – but not necessarily for water, but other boundaries. 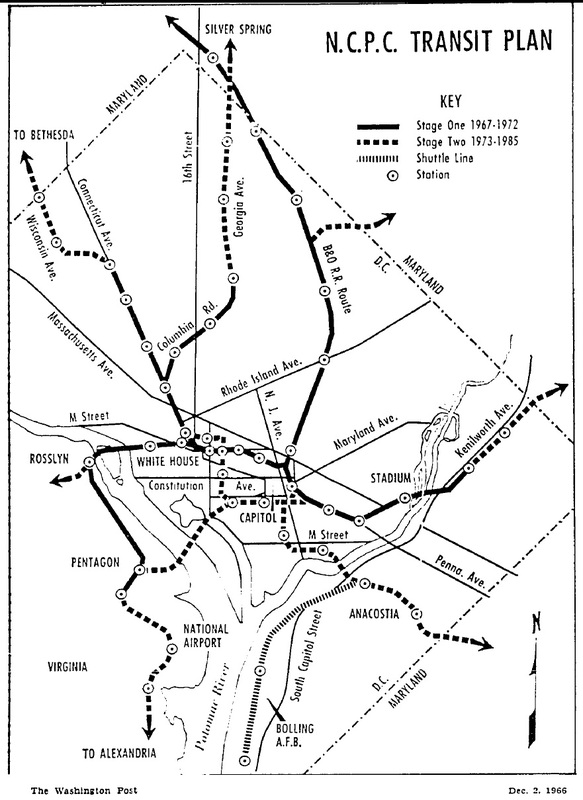 The Red Line was the first to be built because the parts along the existing CSX tracks were relatively easy to build and also were the location of WMATA’s first rail yard (Brentwood). When the decision was made for two downtown trunk lines (what’s now Red and Orange/Blue), White House security had something to do with how things ended up. The Red Line can’t easily continue west from Downtown into Virginia without cutting too close to the White House (as it is, the tracks turn from G St onto Connecticut Ave under Lafayette Park – something I expect would never be allowed in today’s era of security theater). Yea- at least tenatively scheduled to be a circled via the purple line light rail. Los Angeles gold line fits as well. However, once the downtown connector is done, the c will end. According to a map I saw, the expo will run west to east onto the south spur and the green line will run south to north on the gold north spur. Oh yeah, I forgot about that. Yeah, that’s also an aberrant, coming from the incomplete state of the network. Doesn’t this sort of assume a perfect “spoke-and-wheel” model…? I think one reason Tokyo (especially greater Tokyo) has a lot of wacky shaped lines (it’s not just the two you mention) is that the population distribution is pretty wacky as well, and there’s no center strong enough to form the hub of a wheel. What are the others? I tried to disentangle the private railways and couldn’t see anything obvious (maybe Tobu? ); on JR East, at least, the through-lines are more or less linear, other than circular Yamanote and almost-circular Musashino-Keiyo if you count it. Certainly in many cases there’s crazy history at work, but the main thing that’s obvious is that all of these tend to have three parts, “approach tokyo proper”, “follow some route in tokyo, usually not towards the center”, “go away from tokyo proper”, where these parts often go in radically different directions. This generally works out fine, because as you say, few people stay on the the whole distance. To add, the routes tend to have kinks in them as the center is oriented around the Imperial Palace, which cannot be traversed. The Yamanote loop with its various subcenters provide anchoring points for the routes. It can also be said that the subway system was also shaped by the closing of the once-extensive streetcar system, so there may have been a desire to link centers once served by surface lines. Any comments on Kuala Lumpur transit lines, http://www.spad.gov.my/klang-valley-rail-transit-map ?. Linear Kelana Jaya Line (LRT1) extended to a C? Similarly, linear Sri Petaling Line (LRT2) extended to a C? What about, the “S” shaped new MRT line? Not sure… I don’t know KL well enough to comment. But, the only geographic map of MRT Line 1 that I’ve found shows it as fairly linear. It has a lot of little detours, but that’s fairly normal. Compare this with e.g. Shanghai Metro Line 1, which visibly detours to serve People’s Square. If a city’s lines have a lot of these little detours, this probably means the type of development in the city is not along consistent arteries, but rather in pods off of the main roads. In gridded cities like New York, Chicago, and Beijing this doesn’t happen, and lines can be very straight for many kilometers following major streets. Conversely, in very hilly cities with roads that hug the terrain and development that clusters in the valleys or on the hilltops, lines will naturally zigzag. I don’t know how KL’s development patterns go; Singapore is somewhere in the middle between the two extremes – there are long stretches of straight developed road available to current or planned lines that give them some sanity, like Commonwealth and Bukit Timah, but once you get into the central areas you need to zigzag to a new alignment. The North-South Line is really awkward. Taipei’s future network will have several Cs, which seem to reflect ad-hoc planning more than anything. The result will be a system that forces many of its customers to choose between taking indirect routes or transfer more than once to get to their destinations. For example, riders on the Zhonghe Line, the most intensely used branch in the system, will either have to take a longer route via Dongmen or transfer twice at Guting and CKS Memorial Hall to get to Main Station. The transfers are all cross-platform, but judging from the current transfer at Guting they will not all be timed, and will certainly be less convenient than the current direct route with a single transfer at Guting. I suppose this makes sense on a certain level, since there isn’t as much demand to the west of the Danshui River so it makes sense for lines to the east to swing away, but it means many residents will see their commutes become less convenient as new extensions open. It’s more than administrative. Did Hackensack really want the subway? Probably not. There’s some decent geological challenges in the way too. Besides the Hudson River, there’s the Palisades, and then the wetlands surrounding the Hackensack River. It could be overcome, but for what? To get to what was largely a bunch of farmland at the time when my grandfather was a young man living there? Just past the farmland there are mountains just like the Palisades but not on the Hudson Waterfront. The geography of Northern New Jersey versus Brooklyn and Queens had a lot to do with their transit networks. In the 1910s, there was no stigma against having a subway in your neighborhood. Parsons may have routed the First Subway deliberately to avoid connecting the Lower East Side with the Upper East Side, but by 1913 nobody cared anymore. Subways were Progress. 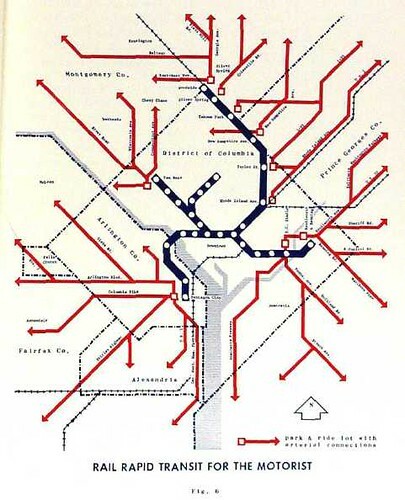 The subway-slum association came later – I think that’s why Washington didn’t route the Orange and Blue Lines through Georgetown – but then everyone wanted subways. You can make an argument that by the 1930s highways were even more Progress, and that’s why the GWB was built only with a future provision for a subway and not (say) with an el over Route 4 in the same way the Williamsburg and Manhattan Bridges were built with rail in them, but in the formative decade of the subway, that was still not an issue. Likewise, nobody cared about near-urban wetlands in the 1910s; the environmental movement then believed in preserving wilderness far from cities, not in prohibiting urban growth and development. Now, you’re right most of Hudson County was undeveloped then. So was most of Queens. Queens was already growing very fast, but for the same administrative reasons that led to more subway development to the east than to the west, there were more bridges across the East River than across the Hudson. Why fill in the swamp when there is plenty of nice dry farmland in Brooklyn and Queens? Far far away from the garbage dumps, pig farms and other smelly endeavors out in the Meadows not to mention the smelly swamp. What about cases where lines were not intended to operate as a single corridor, but “fused” together in their central area to allow through-travel ? That was sort of the case with Washington Metrorail. The first two lines were the Red and Blue lines. They were intended to meet at Metro Center (the center of the shopping district) and Farragut Square (the center of the office district). From Metro Center there was a line east to Union Station and then along the CSX right of way to the northern corner of the ten mile square and another east to the eastern corner. From Farragut there was a line north to Bethesda and another which crossed the river to National Airport and then joined the CSX right of way to the southern corner of the ten mile square. These could have been joined up to create two essentially linear routes, one from the northern corner of the square to the southern corner, the other from the eastern corner to about halfway between the river and the northern corner. Instead they were joined up to create two overlapping C-shaped lines. I don’t think there’s any record of why it happened that way. It may be because the Park Service refused to let there be a single Farragut Square station. But I doubt that anyone much cared. There were lines from four directions which came in to both the central shopping district and the central office district. That was what mattered, not how the run through worked. Running two-made-one odd-shaped lines might have some additional benefits in cities with a dense subway or rail network on its core. It reduces the criticality of a single transfer-point (that would the the endpoint of each line on a central area, maybe even on a single major station). By allowing some through-travel to the borders of the inner area (even so if a circular/orbital line of sorts is available), it multiplies transfer points. That is the case, in many cities, even for tram services. Many tram routes in European cities don’t make sense, geometrically, if you compare them as end-to-end services. However, their design sometimes allow multiple transfer points in whatever inner network core is densely served by many different lines (and train stations and what else), which makes it easier to manage the heavy transfer flows. This is exactly the case in Tokyo (see my earlier comment). Tokyo’s rail network basically looks like someone dumped boiled spaghetti on a plate—but it actually works very well. Certainly some of it is history, but even new lines are being built this way. Why did the Park Service refuse to allow a single Farragut station, anyway? 2012/12/21 - 23:00 Alex B. It would have required dismantling the Farragut statue and having the square closed for several years for cut and cover station construction. They likely would have lost many old trees, as well. NPS doesn’t like that kind of stuff. As it is, they have some preliminary plans for a tunnel to connect the two station mezzanines. There is a free transfer between the two if you have a SmarTrip card. Or the newish SEPTA regional rail operations. Right, the original analysis of the R5 and R6 is off-base. These were four lines merged into two upon construction of the Suburban / Market East link. The Thorndale branch of the R5 was mated with the Doylestown branch because the two had similar riderships, so empty seats would be minimized upon passing through Center City. Likewise with all the other pairs. U4 in Vienna is another example of an “irrationally designed” line if you look on it back-to-back, And it is a fairly recent line. The U4 replaced the original Stadtbahn (which was constructed roughly 100 years ago). Its layout, along the Wienfluss (Vienna River) and the Danube Canal utilized a natural right-of-way. To some extent, I believe, the city of Vienna grew along this C-shaped line (ie. the Karl Marx Hof in Heiligenstadt). 2012/12/23 - 03:11 Ted K.
I suggest you shift SFMuni’s T-Third from category 1 (water) to cat. 5 (aberrations). That line is actually a couplet – K-Ingleside/T-Third. Once the second phase of the T-Third is built* then the overlap/switch-over will be dropped and the K-Ingleside will run from Balboa Park to Embarcadero. You could add SFMuni’s F-Market +Wharves(historic streetcars) to cat. 1 (water). After a straight run down Market St. it hooks around near the Ferry Bldg. to run northwards on the Embarcadero to the Fisherman’s Wharf area. There is also the N-Judah which has a crochet hook connection to the Caltrain depot at Fourth and King. That one I would file as a combination of cat. 1 and cat. 5. *The T-Third’s second phase, aka the Central Subway, is one of those projects where the engineers were buried by a political avalanche. Mistakes were made in phase one (Sunnydale to King), more are planned for phase two (King to Chinatown), and God only knows if they’ll ever get around to phase three (Sunnydale to Caltrain/Tunnel Ave.). Is anyone knowledgeable about Moscow? On paper, it looks like a radial system, with the ring line (Stalin’s “brown line, from his mythical coffee cup!). However, I am told that some of the inbound trains are routed onto the ring, and then inbound, only on a different radial. Does anyone have a better understanding of this? I don’t know about operations. I do know about the construction history. The ring line was constructed piecemeal. Moscow repeatedly built “branch lines” off its subway lines, and then separated the branch off and attached to to a new “trunk”. And repeat. The same was done in Paris and London. The ring line has several interconnections with other lines which date from the historical use of pieces of it as “branch lines”. I would not be surprised if they are still used. Side note: When they were trying to expand the subway network in New York after the initial IRT line, the H&M(now PATH) offered to extend its services and create a New York-New Jersey subway service, using a very similar gauge to IRT trains. It didn’t happen because August Belmont didn’t want a competitor and basically convinced everyone in the financial sector not to give H&M a loan. It’s really sad that even one division of the MTA can’t overcome administrative boundaries. There are very few inter-borough bus routes, and those that exist barely dip their toes in the other borough. 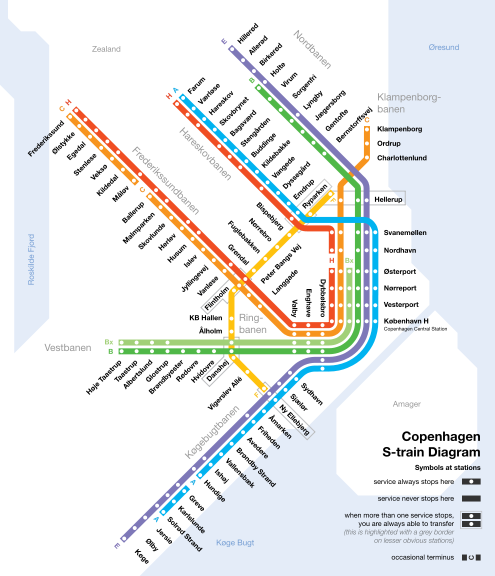 Line F in Copenhagen is another example of a C-shaped route motivated by water. It opened in 2008 and is marked by yellow in the link below. The purpose of those C-shaped lines are so that people could get from Queens to Manhattan or Brooklyn. By the way, the M before 2010 was not C-shaped. It looked more like an S shape.